Does underwater temple really exist? Hmm.. kind of! If you got a chance to scuba-dive in Bali, apart from other famous dive places such as Tulamben, Nusa Penida, Menjangan, etc… you should also make your way to Pemuteran. It takes about 3 hours from Denpasar to get there. Pretty far, but worth it. When my friend Nicky who owns Bali Marine Sports dive center showed me a picture of the underwater temple a few weeks ago, I got so excited and promised myself to go there. Two weeks later, I came to Bali again, special to dive in the underwater temple :D. Nicky warned me that it’s an eery dive site. Usually, local dive masters wouldn’t go there if there are only 1-2 divers. Too creepy, he said. Really? I couldn’t believe him, ‘coz I thought, what’s so creepy about an underwater temple? The temple isn’t even a drowned temple. People made it. So, it wouldn’t be so creepy, would it? From “Taman Selini” beach, we got into a traditional boat (not a dive boat) and drove for about 10 minutes to the dive site. There were 5 of us, including Rafi, the dive master. 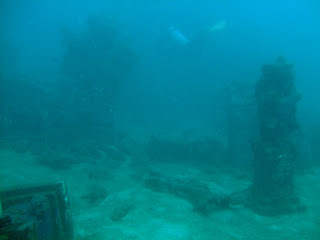 Before we jumped into the water, Rafi told us the story of this so called underwater temple. 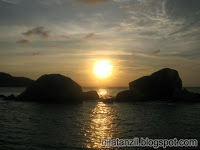 Back in 2005, there was a reconstructed temple in Pemuteran and the locals threw away stones and statues from that temple to the sea. 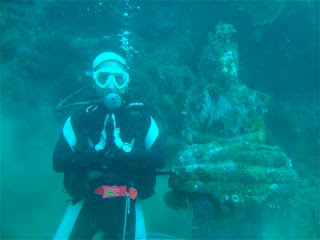 Then, the local dive center(s) decided to re-arrange those statues, underwater! This underwater temple “project” was funded by AUSAID and it’s located in 15-30 meters below the surface in the area of 2,500 meter square. Soon, we jumped in and started making bubbles out of our regulators. The visibility was poor. Hmmm.. that’s probably why people get an eery feeling when they dive here! Going down to around 30 meters, we arrived at the “temple”. Whoa!! It felt like visiting a Roman Forum, but in “Balinese” style! The temple was ruined, but we still could see the Balinese style gate and statues. There were not so many fish here, but I saw a scorpion fish and two cute pipe fish walking around enjoying the exotic Balinese sands happily! Good job for whoever helped to construct this “Temple Point/Temple Garden“. It’s definitely an interesting dive site!